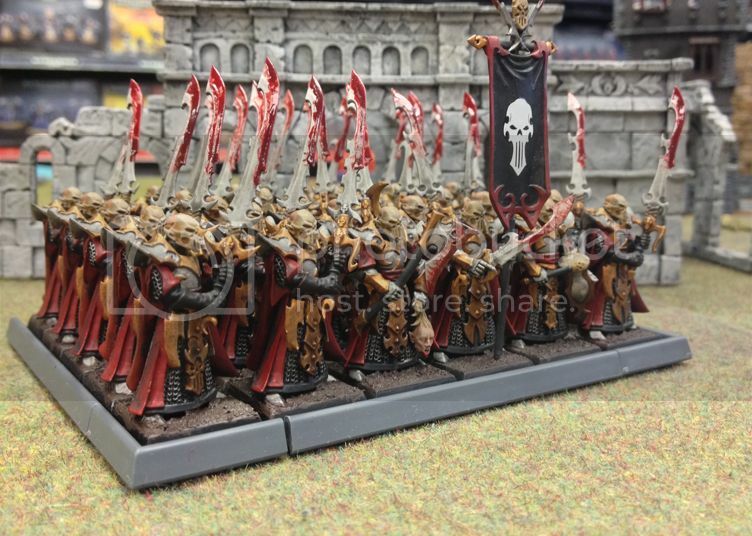 With the arrival of the new army book in October last year, and my local store running an escalation campaign, I've decided to do the Har Ganeth army i've always wanted to do but haven't really been able to. The rules for the campaign are that we began with an 800pt force, which can't change as the game goes on, so any heroes in that force remain with you. 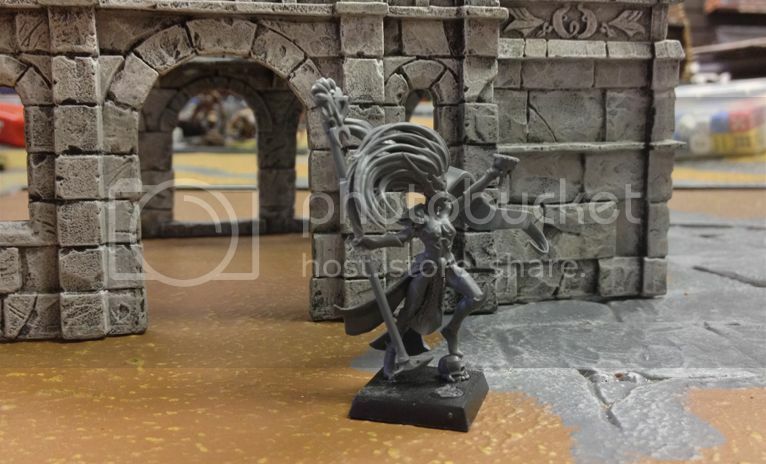 Due to not being keen on taking a Hag (without a BSB) in my list, and with Hellbron coming in at 310 points, I was resigned to using Tularis Dreadbringer as my army's general (until 1500points) and without a model set off to convert my own. I'll be adding units as they're complete, but to start off, here's Tularis himself. Last edited by Thetosh on Wed Feb 12, 2014 8:56 pm, edited 1 time in total. Well done indeed! 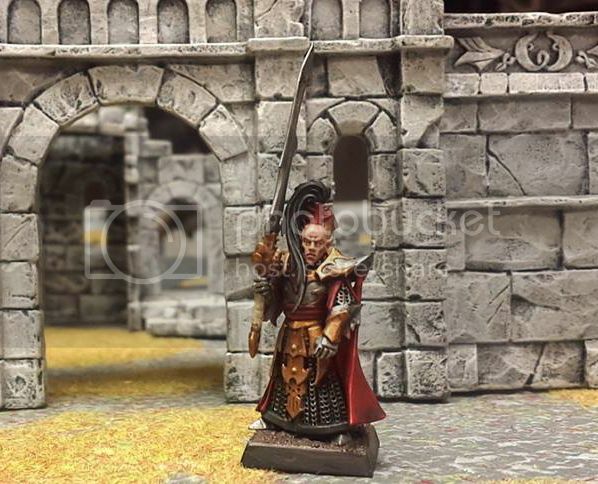 Will look forward to seeing Mr. Dreadbringer with his executioners as well. Nice background for the pic, too! Nice work, look forward to seeing the rest of his gang. Thanks for the positive comments guys! 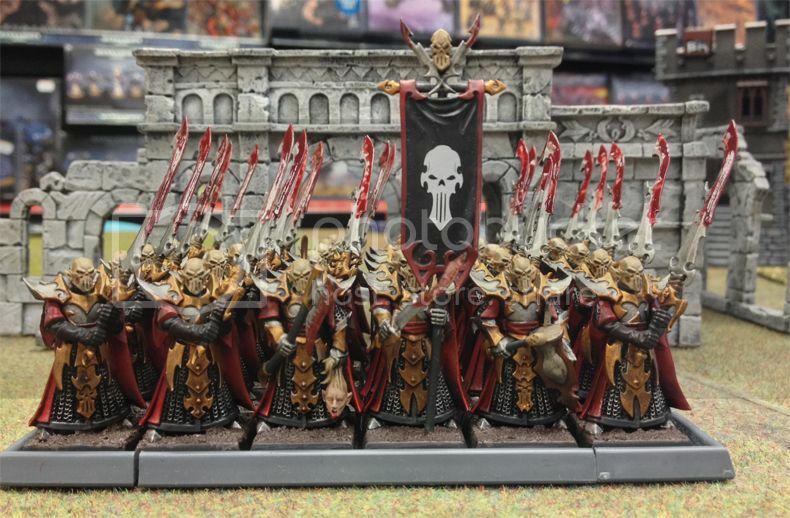 It'll be a while before I have the 30 executioners ready to show off with Tularis, but for now I do have 10 Har Ganeth Darkshards ready to pepper the enemy with a hail of bolts. Looking good there. Nice to see the theme throughout all the units. Love the colour scheme and crisp painting. nice clean paintjob, looks good! 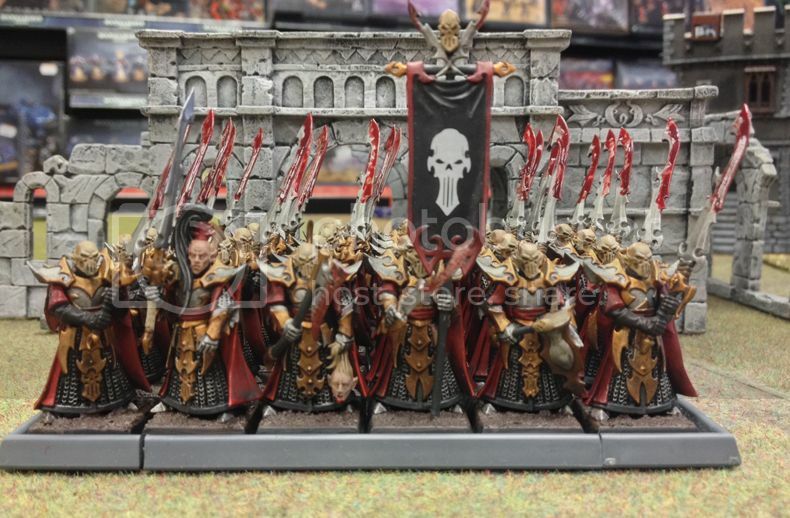 Did you freehand that banner?! Thank you all for the incredibly positive comments! 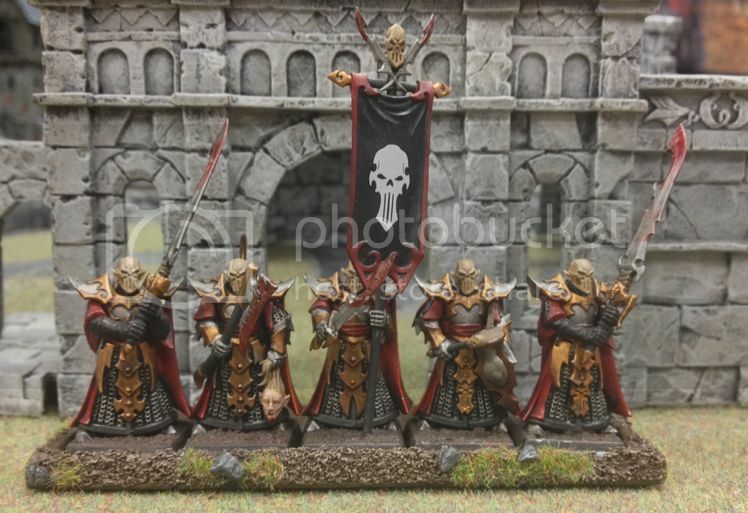 I hope to have the Executioners finished within the week and ready to post up. @T.D: that's some very high praise, thank you very much! I just hope that I can live up to it with the other units. 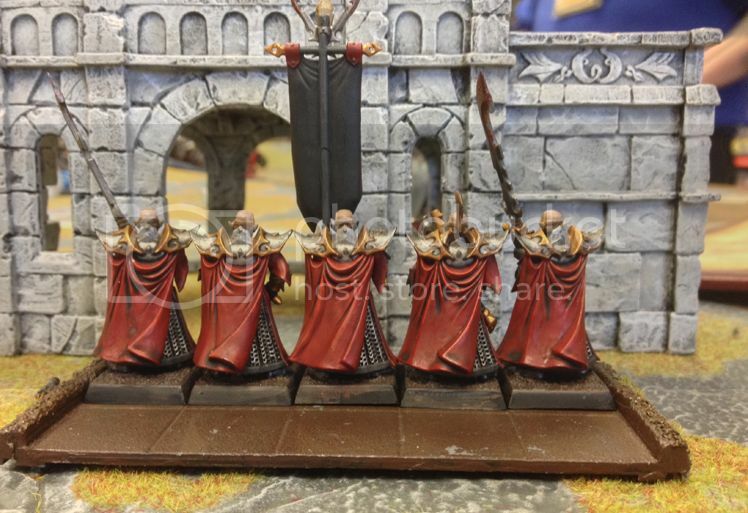 @ MangoPunch: I wish my painting was so good that I could freehand those banners! Both are actually from the new Transfer Sheets, and I have to say as the first transfers I've ever used, I'm very pleased! Love the painting, very crisp. Do you have ano shots of their backs? I'd like to see the cloaks. It's been a bit of a slow week for me, so no updaes on the Execs as of yet (and my tomorrow just got filled up so so chance to paint now until Sunday) but I hope to have them completed by the next time I go into my local GW (which is Tuesday) and can get a picture. I'll also be purchasing the Cauldron of Blood I need and the last 10 Witches, which means I can make a start on them soon as well. 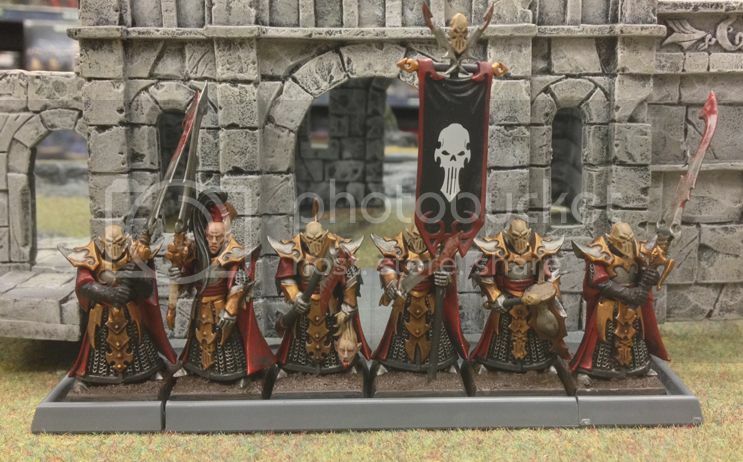 For now though, he's the backs of the first 5 Executioners as requested. 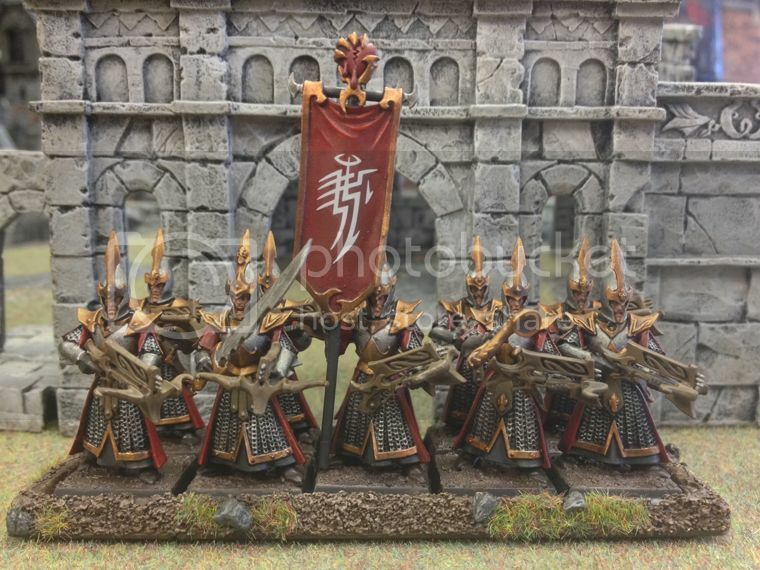 Cloaks are looking good there. Nice shading work. I can't shade red to save my life that's why I asked to see the cloaks. These are amazing. Highlight with Evil Sun Scarlet. Well so I didn't get the Execs done in time to photograph them today at GW, but I -did- get a conversion piece done. She's just going to be a tease right now but I hope to have her at least mostly painted on Saturday. And hopefully have the Execs photo'd on Friday. She is looking good. Nice conversion. And thats a beautiful conversion. So they're finally done, and the fully painted Executioners whetted their blades in a bout against our most hated kin, wiping out three seperate units and securing victory! Next step, the Witch Elves! Wow, they look badass! For some reason, I only really noticed the blood now and it makes them look even more scary. Awesome painting, I can't wait to see more from you. Very nicely painted, with great care. I'm not sold onto the blood, though. Blood is liquid, and in no way would glue on the swords as it is shown there, especially with swords risen. or they should have much, much less blood on their swords.